#selangorlicious eat out is one of the events aimed to promote selangor as a food destination in malaysia and to have a website akin to yelp and urbanspoon for food mainly in the selangor region. my first #selangorlicious eat out last weekend brought me to restoran jamal mohammed, which is located across from wisma FAM in kelana jaya. i used to frequent that mamak place with my sisters for a late night suppers and "catching up" (more like good gossip) before i moved to the states. they've not only renovated the place but also revamped their menu with the addition of different stalls that offer variety of halal food be it malay, chinese or indian cuisine. the focus of this entry is on one of the most popular must try which i have heard everything good about from this place:: the nasi lemak kangkung kukus. even my sisters vouched for its deliciousness albeit the price being a little steep. i was looking forward to the nasi lemak experience since it is what i crave the most when i am out of the country. 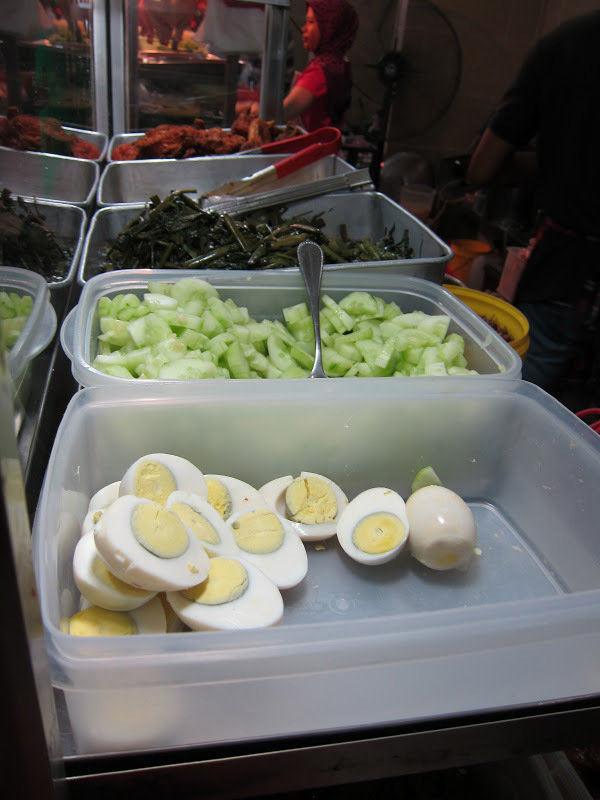 i've decided to share a plate of the nasi lemak with one of the new foodie friends i met from this event. well, reason simply being that i wanted to try as much food as i can. the line at the stall is tremendously long and i've heard it sells out pretty quickly throughout the day. there are so many different types of meat ranging from fried chicken, to beef rendang and squid sambal that it would be more of a problem trying to narrow down which of the few things you would want to eat. and of course, you have to go with the namesake -- the kangkung (a.k.a water convolvulus) itself. presentation is the last on their list when it comes to food stalls.. at least most of the time. i like that they added banana leaf at the bottom to add a fresh fragrance to the whole dish. well, let's break it down, shall we? the rice. typically coconut milk rice is the highlight of nasi lemak. off the bat -- the coconut milk and pandan fragrance were too subtle and i was wishing for more. the rice itself felt like regular white rice. however, the kangkung was great, retaining its crunchiness and seasoned just right. we opted to try something different with our main dishes - the beef rendang, for one was a tad dry and didn't have the balance spice and ginger balance. the brown squid, on the other hand was cooked really well with a good bite and the spiciness of the sambal was just right. the dish was alright and wasn't as great as i thought it was rumored to be, unfortunately. maybe it has something to do with my high expectations for this nasi lemak but i, honestly, don't get the hype. 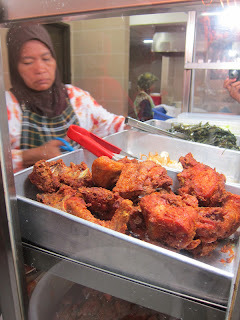 i noticed that the other customers who ordered nasi lemak chose the fried chicken instead (RM6). in fact, a couple of the other #selangorlicious foodies had similar minds. there are several other stalls that has its own following such as the penang char kuey teow, a local favorite (RM4.50) fried by aunty gemuk (her nickname is fat lady, in the most respectable way). while i was planning to order this, we were so caught up with so many other options that we passed on it. however, a few other foodies at our table ordered a couple of plates. just based on the look of the noodles, it doesn't have enough char on the noodles which is an important aspect of this dish itself. hence the name char kuey teow. the color is pale which is pretty much the representation of its bland flavors. even with the extra chilli in it, it was lacking in flavor. two out of two not so good so far which was a tad disappointing. possibly our favorite of the day :: tauhu bakar (or translated as grilled/roasted tofu). it is tofu pockets grilled over a hot plate till crunchy and then filled with a mixture of strips of crisp and fresh cucumber, bean sprouts and chopped peanuts in sweet and savory shrimp paste sauce. it was crunchy on the outside that encompassed all the sweet, savory, fresh and crisp goodness inside. i did wish there were more filling to balance the amount of tofu itself. curry noodles -- which i didn't have a taste of but a fellow foodie confided that it was pretty delicious and the lime was a much needed accompaniment. cantonese fried noodles -- rice noodles bathed in smooth eggy gravy. from the one small bite i had, it tasted pretty authentically delicious. the sauce was not too thick and seasoned well. wanton noodles with roasted chicken -- so we had this dish sitting at our table for the longest time and we looked at one another asking who actually ordered it. since no one claimed it, one of the guys decided to eat it up anyway since it was gonna go to waste and when i asked him what he thought about it, he said he preferred the regular chinese wanton noodles. teh tarik (a.k.a. pulled tea). i've decided that it's kinda pointless at most places whenever i ordered it to be less sweet (kurang manis) because it ends up being too sweet. this place was no different. 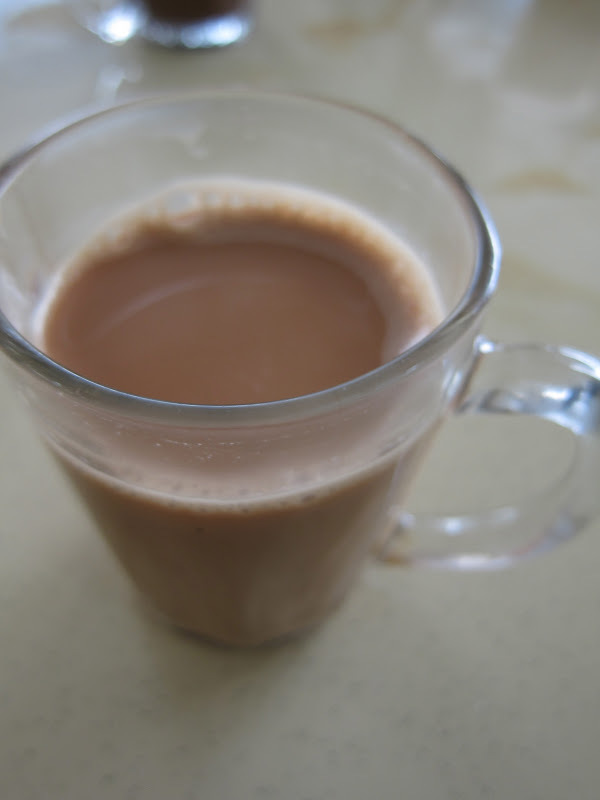 teh o' ais limau (a.k.a. iced lime tea) was a refreshing drink after a whole morning of food tasting. not too sweet, thank goodness and just the right amount of lime juice in it. 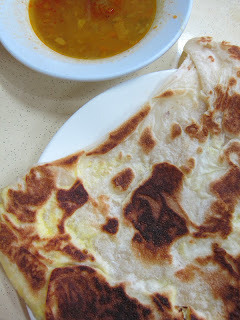 roti telur otherwise better known in english as prata bread with egg. i thought it was decent and wished for a sprinkle of salt to bring out the flavor more. there wasn't much of a crunch on the skin which i have yet to find someone who can make it that way. another counterpart which is roti telur bawang that has the additional chopped shallots. the shallots were raw which i feel is not a good combination with the rest of the prata bread. roti planta is actually regular prata bread, only difference is it is cooked in margarine and typically with sugar as well. planta is a common brand of margarine used here. this was slightly crispy and just a good amount of sweetness that it reminded me of a thicker version of roti tisu. murtabak daging or translated as meat curry parcel. it is usually served with pink pickled onions and dahl which are made of yellow lentils. this one had a punch of spices that i didn't mind but it was too strong for others around the table. regardless, there are quite a few selections of halal cuisine if you are looking for a morning brunch spot. am i inclined to go back? not really but i don't mind giving the nasi lemak another shot. speaking to the #selangorlicious organizers, i found out that they were here the weekend before to do an initial test run and could only think of good things to say about it. as i said, even good cooks/chefs have their bad days. disclaimer this is written based on personal experience and opinion. experiences and taste buds may vary for others. I really appreciate this post. I? if i stop, i die "